Baiao kindly shared this picture of their family Folar! This recipe also uses almonds. Shopping at the local farmers market a couple of years ago I could not help but notice a crowd of women gathering round a particular cake stall. Curiosity eventually getting the better of me I went over to investigate and squeezed my way through to the front of the queue. I discovered the buying frenzy was for an odd-looking “cake” that had a hard-boiled egg (complete with their shell) embedded in the centre. I understood just enough Portuguese to establish it was actually traditional “bread” called Folar and was eaten at Easter. Intrigued, especially as they were literally selling like “hot-cakes” I decided to bite-the-bullet and bought one to surprise some friends who were coming for lunch Easter Sunday. Sadly they were not that impressed as pieces of eggshell remained embedded in the bread which made for a rather bizarre gastronomic experience to say the least. Years later I am more keen to discover as to the “WHY” hardboiled eggs are included and the story behind it…and “HOW” to cook my own Folar. 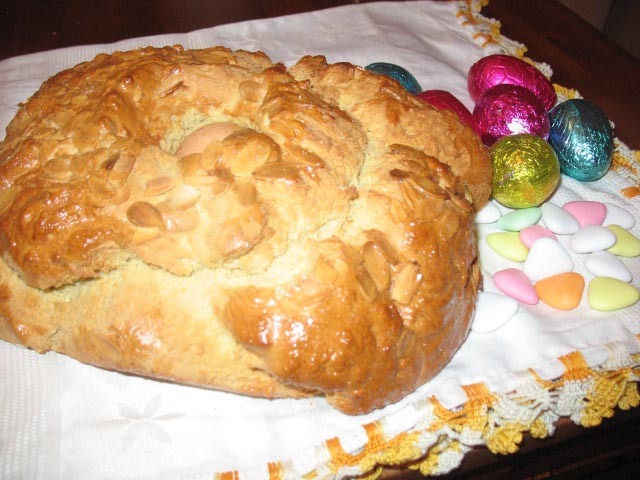 Folar is traditional Portuguese Easter bread and contains hard-boiled eggs. The eggs apparently stem from the Pagan festival Oestre (egg) where eggs were used to symbolize rebirth. Despite regional variations such as including lemon zest, almonds or cinnamon they all contain hard-boiled eggs held in place by a cross of bread dough. Recipe courtesy of Paws2Claws from Central Portugal. This is the recipe her Portuguese neighbour uses and kindly passed on. In a bowl combine the yeast, 1/4 of the flour, a 1/3 of the milk (warmed) and half the sugar. Whisk the eggs with the salt and spices and remaining milk and sugar. Kneed in the flour and egg mix to the dough gradually then kneed in the butter. Cover the dough and leave it to rise for about three hours in a warm place. Break the dough into two (or leave whole) and plant the eggs on top. Make a cross with two rolled lengths of dough to put on the top, holding the egg in place. Brush the bread with the beaten egg. I had planned to “experiment” with this recipe on Friday, but after 6 hour lunch with a group of friends meant I was not in a fit state to cook anything by the time I returned home! I am yet to attempt the recipe and photograph the result! I am unsure of the original source of the above photo but it at least gives you an idea of what the Folar “should” look like. In the UK we have hotcross buns which are delicious. Why not give them a try? What traditional food do you like to have at Easter? I always love to hear about traditions of any kind. That includes traditional food 🙂 Thanks for sharing this! I find the research fascinating…even if I am not to sure on the recipe! Interesting recipe and result PiP! Hi Barb…the Photo was only borrowed to prove that’s where the eggs go! Too bad about the eggshell…when I was young, I loved egg salad sandwiches but was obsessed with worry about tiny pieces of eggshell that might crunch in my mouth as I chewed…obsessed with worry because it happened all too often. 🙂 But the recipe sounds great…and the eggs we color for Easter and put in Easter baskets probably stem from the same pagan tradition…hurray for the pagans. 🙂 Without them, we probably would have no traditions at all. 🙂 Thanks for a really interesting post, PiP! I love Hot Cross Buns. That’s what my mom always made. Yes, hot cross buns are one of my favourite Easter foods along with gooey Cadbury Cream Eggs 🙂 Unfortunately, I am unable to get either here very easily. Never mind I am going to make my own hot cross buns! Baião see comment below has just mentioned there are recipes without eggs. He has just kindly sent me a picture of their Folar so I am changing the picture! I am gradually discovering their are not only some great Portuguese recipes but they also come with regional variations as well! Baiao has since kindly shared the photo of his family’s Fola! the name is folar, not “Páscoa do Folar” (this doesn’t make sense) and is traditional from the Easter (Páscoa) festivities. There are versions of Folar without eggs. It’s a simple cake with very little sugar on it, the idea is to be simple, following the religious festivities. There is a nice market in S. Marcos da Serra where they sell a lot of them. PS-The eggs, if you want to eat them, it’s better to take out the shell first. I suggest the portuguese to sell the folar with instructions “how to eat”…. LOL 🙂 thanks so much! As you can see I get my Portuguese back to front and the wrong way round!! I will make the amendments now! Teach me to write something whilst under the influence! 🙂 You can see how much gets lost in translation 😦 I think personally I would prefer the folar without eggs – do you have the recipe by any chance please? Hot cross buns! And chocolate in any and every form! I love the recipe …. thinking about trying it myself. 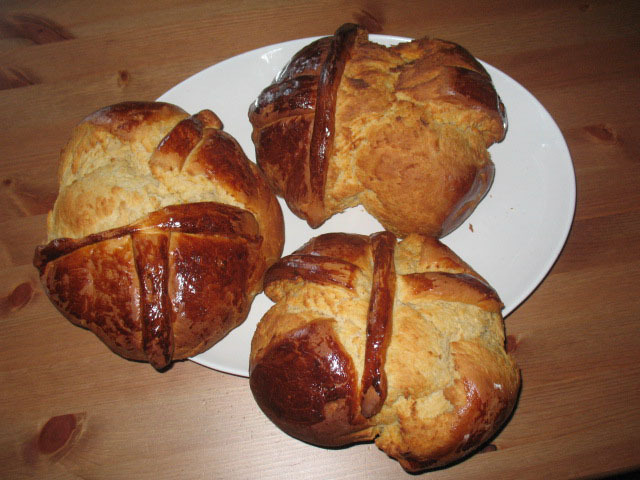 Hi FD hot cross buns…hmmm I feel homesick! A strange cake indeed. I’m more intrigued about the 6 hour lunch! That’s some serious lunching! Oh, hot cross buns. I love them so! Yum! And Easter candy is my absolute favorite. All kinds. Good luck making hot cross buns. I saw a recipe on Pioneer Woman, but haven’t tried it. I liked it just from the photo of the bread! I didn’t need to read to like! Six hour lunch, hey? Hmmmmmmmmm – retirement sounds like BLISS!! Hi EC I really enjoy researching the different aspects of Portuguese culture but it’s amazing how the stories and recipes vary. Very interesting. I learned something new! 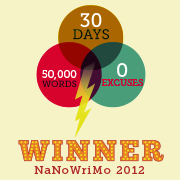 Thanks for visiting my blog today…. Hi Dianna and welcome 🙂 I felt so sorry for the people losing thier homes in the tournado…so sad. The algarve version of Folar. hi, there are diferent types of Folar. At the north of the country, the “Folar” is salty and with little pieces of meat (chorizo, ham, bacon). I don’t like the “Folar” eggs style. Hi Samuel, I’d love to try this version as I don’t like the egg one! I bake a lot of bread too and traditions are good….but i will try replacing shelled eggs with ones without shells! Sounds a good plan to me! I wonder though if we should be keeping this bread in the fridge if it contains eggs? You don’t have to if you serve them on the side. I am Portuguese and make my own folares. I still hard boil the eggs but serve them on the side. The main reason is that I make a big batch and freeze some for later, and eggs don’t freeze well. Hope this helps. Thank you for sharing the tips. I will certainly be try to make my own folar next Easter!